After initiating a move to get 238 acres of panchayati land in Vaaser village vacated from the “illegal” possession of the villagers, the district administration yesterday faced armed resistance by the villagers. Influx of hazardous chemicals and other effluents in the Ghaggar has reached alarming proportions causing great damage to flora and fauna in the areas. A portion of the Avardhan river near Uskakhadar and Rajheri villages in the Radaur block of Yamunanagar district developed a breach today. With the arrest of Manisha Yadav, daughter-in-law of Ved Prakash Yadav, and her cousin Rohit Yadav, the Rewari police has cracked the blind murder of Ved Prakash (65), a retired government employee, who was done to death with a sharp-edged weapon in Sector 4 here on December 3. The sudden drop in temperature in Karnal and the adjoining areas, chilling people to the bones, has brought cheer to the farmers as low temperature is considered beneficial for the wheat crop. There is bad news for the building byelaws violators on plots less than two kanals with the Haryana Government amending its policy of charging the compounding fee on buildings. Metro technology for Haryana sewerage lines? Yes. This is what Haryana Public Health Engineering Minister Kiran Choudhry has in her mind for reviving old sewerage lines in various towns, where it is not possible to lay down new lines in view of the massive construction. The Haryana Government has transferred 11 HCS officers with immediate effect. The police has booked three persons for murder after a married woman of Vaidwala village, who sustained serious burn injuries at Nejadela Kalan, died in the General Hospital today. Labho Devi (35) was shifted to the General Hospital on December 3 with serious burn injuries. The district police on Tuesday arrested three robbers. District police chief Pankaj Nain said acting on a tip-off the police raided a hideout of these robbers in Saudapur village of the district on Monday night. The arrested persons were identified as Sunil, Kuldip and Gaurav, who were wanted in several cases. The police also seized two country-made pistols and bullets from the accused along with an iron rod and a motorbike. 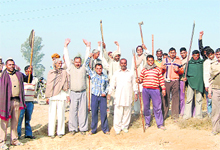 After initiating a move to get 238 acres of panchayati land in Vaaser village vacated from the “illegal” possession of the villagers, the district administration yesterday faced armed resistance by the villagers, who claimed to have taken the land on lease after paying the Gram Sudhar Committee the requisite amount. It was in May last year that after electing a Gram Sudhar Committee, the villagers distributed 238 acres of cultivable panchayati land among themselves. The administration claimed that the procedure of leasing the land was kept hidden from the department concerned and was thus illegal. Though the villagers claimed that they had deposited Rs 43 lakh last year and Rs 50 lakh this year with the Gram Sudhar Committee to cultivate the panchayati land and reap the crops, but senior officials of the district administration maintained that according to a ruling by the Supreme Court, such leasing of panchayati land was illegal and thus they initiated a move to get it vacated from the villagers. However, when the officials along with the armed police went to the village, they were greeted by violent villagers armed with agricultural implements, who warned the officials to dire consequences if they went ahead with any move to vacate the land that was being cultivated by them. Officials maintained that the situation in the village could turn violent as the villagers were in no mood to give up the “illegal” possession of the land and were ready to get into any conflict with the security forces. They said that as of now the move to take back the possession had been suspended till an effective plan of action was drawn to get back the panchayat land. Influx of hazardous chemicals and other effluents in the Ghaggar has reached alarming proportions causing great damage to flora and fauna in the areas irrigated by distributaries originating from Ottu Weir near Rania town of the district. The pollution of Ghaggar is also causing damage to the subsoil water and in the process causing skin diseases and other ailments to the human population using it. Fishing contractors complain that a large number of fish have been dying in Ottu Lake daily. Not only fish, other creatures living under water have also been dying due to the highly polluted waters leading to an all- pervading stink in the vicinity of the Ghaggar. Against the normal bio-chemical oxygen demand (BOD) level of 3 mg per liter, the Ghaggar water has been found having BOD level of 25 to 30 mg per litre, when the samples were last taken near Chandpura in Fatehabad and Ottu in Sirsa. The colour of the water is so black that its pollution can be observed by the naked eye. Originating from the Shiwaliks, the Ghaggar River reaches Sirsa after passing through parts of Himachal, Punjab and Haryana and has become a source of irrigation for farmers of over a hundred villages of Rania, Ellenabad and Chopta blocks of the district over the years. The water brings with it industrial effluents and sewage waste of the towns falling on its banks in the states through which it passes. “The Central as well as the State Pollution Control Board, it seems, have shut their eyes to the criminal pollution of Ghaggar,” alleged Swaran Singh Virk, state vice-president of the Haryana Kisan Sabha, whose own village Kariwala falls on the seasonal river. He alleged that the number of cases of infective hepatitis and skin ailments were rising in the area, and if the government failed to take suitable action, the situation could assume alarming proportions. Several efforts in the past have failed to solve the problem. Ashok Tanwar, MP from Sirsa, had met the then Environment Minister, Jairam Ramesh, in February this year and even the Haryana Environment Minister Ajay Singh Yadav had said that the state government had taken up the matter with the Central Pollution Control Board. Now, Sirsa Deputy Commissioner Sameer Pal Srow has written to the Chairman of the Haryana State Pollution Control Board requesting a joint meeting of the State Pollution Control Boards of Himachal, Punjab and Haryana along with the Deputy Commissioners of the districts falling in the Ghaggar area to find a solution to the issue. Meanwhile, DB Batra, Regional Officer of the Haryana State Pollution Control Board at Hisar said the pollution in the Ghaggar came from industrial effluents and sewage waste of Punjab towns. He said a senior scientist of the Central Pollution Control Board was expected to visit here later this month. Deputy Commissioner Ashok Sangwan along with other officers of the administration reached the spot. He said elaborate arrangements had been put in place, including two JCB machines, and a team of officials was monitoring the situation. The breach, which spoiled the crop, mostly vegetables, was controlled by the administration after seven hours. Manisha, wife of the deceased’s elder son Naresh Yadav, is a lecturer at Government Senior Secondary School for Boys here whereas Naresh is a lecturer at a college in Nangal Chaudhary (Mahendragarh) . Both Manisha and Rohit were today produced in the court of Chief Judicial Magistrate Shashi Bala Chauhan, who remanded Rohit in police custody for three days while Manisha was sent to 14-day judicial custody. Vikas Arora, SP, said the duo had confessed to the crime. Subdivisional agriculture officer Wazir Singh said low temperature along with cool nights, warm days and foggy conditions were ideal for tillering. At present wheat has been sown over an area of 1.70 lakh hectares. Indu Sharma, Director, Wheat Research Centre, said the weather conditions were conducive for wheat crop and rain would further brighten the crop prospects. Some of the farmers who had sown PWB 550 before November 15 are facing the problem of the crop moving to the jointing stage, she added. Last year, Haryana achieved a record production of 116.3 metric tonnes with yield of 4,624 kg per hectare and the target has been increased to 118.3 metric tonnes this year which is likely to be met easily with productivity likely to increase to 4,735 kg per hectare this year due to favourable weather conditions even though the area would remain the same. Timely and late varieties adopted by the farmers this year included WH 542, PBW 550, UP 2338, DWB 17, WH 711, WH 147, PBW 343, WH 1021, PBW 509, etc. “Now, such violations will not be compounded for residential/industrial plotted colonies with respect to individual plots up to two kanals in the case of residential plots and 2,000 square metres in the case of industrial plots,” says an order of the Town and Country Planning Department. In fact, she says, a pilot project in Bhiwani has yielded good results. Slowly, it will be taken to other towns also. Choudhry has written to Delhi Metro head E. Sreedharan. With this technology, a strong lining is made on the internal side of sewerage pipes, which enhances their durability. In another major initiative, Choudhry has banned the use of asbestos pipes for carrying water in her department. Instead, it has been decided to use ductile iron (DI) pipes henceforth. The department has already purchased about 3,000-km long DI pipes worth Rs 287 crore. These pipes, she says, were purchased after hard negotiations and by increasing competition at the rates much lower than the previous years despite an overall price rise. The government saved Rs 12.44 crore on the purchase of DI pipes. SK Setia, awaiting posting orders, has been posted as Secretary, Backward Classes Commission. Sandeep Singh has been posting as Estate Officer HUDA, Hisar relieving Amardeep Jain. Bir Singh, Managing Director, Coop. Sugar Mills, Rohtak, has been posted as SDM, Indri relieving Pardeep Kumar-1. Sushil Kumar, Extra Assistant Commissioner under training, Karnal, becomes City Magistrate, Karnal. Anu will be new City Magistrate of Faridabad. Virat goes as General Manager, HR, Dadri. Dalbir Singh goes as GM, HR, Chandigarh vice Bhanwarjeet Singh. Reagan Kumar becomes GM, HR, Fatehabad relieving Baljeet Singh. Amarjit Singh has been posted as Joint Director (Admn.) Medical Education. Satish Kumar goes as General Manager, HR, Sirsa. Nain said Sunil and Kuldeep were also wanted in connection with various incidents of crime in other districts.